· Traveleasy Ltd - Shop 316, 3/F, World Wide Centre, 19 Des Voeux Road Central, Central, Hong Kong. Peak Tram ticket cannot be redeemed directly from Peak Tram Station by presenting iVenture card. Ticket must be used on the same day for both uphill & downhill ride. In the case of any disputes, the decision of Peak Tramways Company, Limited and The Peak Tower Limited shall be final. All aboard one of Hong Kong’s leading tourist activities! 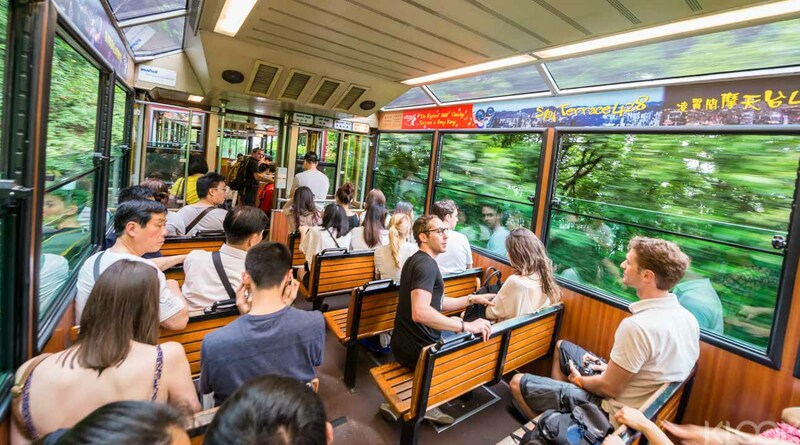 Many agree that the Peak Tram, which has become part of Hong Kong’s rich heritage, is the only way to experience the area’s natural wonders, and it has been transporting people up to Victoria Peak for over 100 years. The Peak Tram’s monumental journey up the slopes starts at the very foot of the mountain and runs on tracks that smoothly follow the mountain’s natural curves. 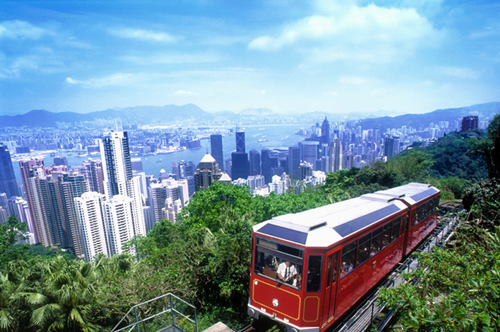 It takes seven minutes, with a few stops along the way, to travel 396 metres up to Victoria Peak, and the tram can carry over 100 eager passengers. You are then met with an unforgettable experience at the top. The Peak Tram affords its visitors a very unique and spectacular perspective of Hong Kong - breathtaking doesn’t cover it! The Peak Tram Historical Gallery, located at the tram’s lower terminus, is also worth the visit, delivering a look back in time to Hong Kong in the 19th and 20th centuries. The Peak Tram is special for a few reasons. It is treated with respect by locals and is venerated for its almost magical properties. Why? Well, visitors can enjoy a spectacular visual illusion when going up the peak. When travelling uphill, the high rises of the right side of the tram appear to fall towards the peak. This amazing illusion is nothing to be afraid of, instead it offers passengers the magnificent illusion that their surroundings are almost falling away as the tram travels upwards. The Peak Tram has a few intermediate stops along its way up the Peak but doesn’t stop unless the bell is rung. So it’s worth remembering to ring the bell to notify the driver if you want to get off and take a look around at any time. The Peak Tram’s busiest hours are 6-8pm as the views with dusk drawing in are particularly impressive, which is worth knowing so you can weigh up whether you’d dare risk the crowds for the best view or not! One further tip to note is, if you’re visiting Peak Tram on a particularly humid day, you can take a bus to the top of the Peak from Central Station. The bus will be fully air-conditioned and then you can take the tram to the bottom once you’ve checked out the stunning views from the top.